Why not choose the calm and warm climate of the Langres region for your next holiday? Book your stay with family, friends or just your special someone at Les Chalets de la Vingeanne and enjoy a great time between Champagne and Burgundy! Featuring an exceptional location beside Lake Vingeanne, the holiday village welcomes you into its tranquil setting. Our 58 chalets overlooking the lake are nestled amongst the lush vegetation of trees and flowering shrubs. A lounge with kitchenette (dishwasher, microwave, refrigerator, toaster, coffee maker, kettle and electric stove). Covering a surface area of 39 m2, each chalet is spacious, bright and practical. 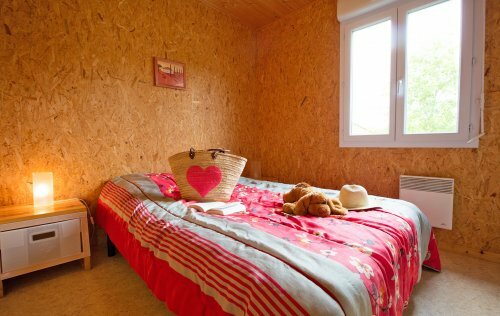 Four chalets at Les Chalets de la Vingeanne holiday village are suitable for persons with reduced mobility. 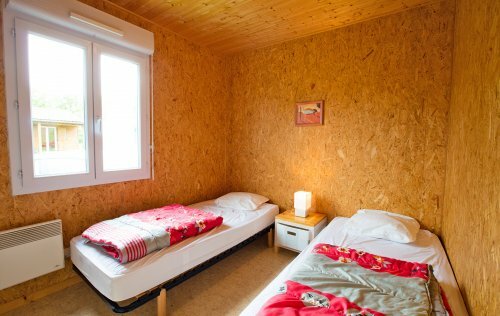 Your wheelchair-friendly chalet in Champagne enables you to enjoy the holiday village’s stunning setting. Each chalet has a private, covered patio with a storage shed and water supply. What an ideal place for enjoying fun times with family, friends or your special someone! If you wish, you can enjoy wifi Internet during your stay (surcharge).